Courtney left town yesterday morning for a critical care nursing conference in Houston. She won't be back until Wednesday evening, which makes it a little more challenging to do something nice for her each day. Sometimes when Courtney travels, she gets kind of nauseous. Couple that with pregnancy and, well, you can see how it would be even worse. One thing that's always helped her, though, is sour candy. On Friday night, when I ran out to get ice cream for movie night, I ducked into Walgreens and bought a card and some Sour Patch Kids. After the movie was over, I quickly wrote a note in the card and slipped both items into her suitcase while she was in the next room. I got this text from her yesterday while I was out with the kids. Success! 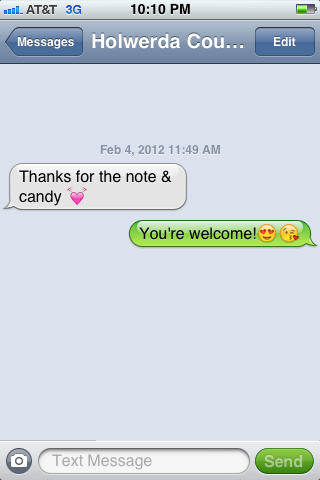 And yeah, I put little smoochie smilies in my message. Deal with it. What's funnier than the smoochies is that you put your wife in your phone as Courtney Holwerda. That's my nickname for her. It just happens to be the same as her real name.